I was happy, they were going well, and I had made some significant progress. I decided to try them on to see how they looked. And that would be when I discovered a small problem. As in, they were too small. I could get them over my heel, but just barely. I let them sit all day while I consternated – to frog, or not to frog. The more I thought about it, the more I realized that I was never going to be happy with them not fitting, so I should really frog them and restart. Before I pulled the needles out, I took a quick measure of my socks. (Yeah, yeah, I know. If I had done a gauge swatch…) Anyway, they should have been 4″ across the stitches on one circ needle. Mine? 3.75″. WHAT? I was actually getting a SMALLER gauge? That never happens to me – I always have to size down! I think part of it may have been that the yarn is smaller, but I’m not totally sure. Slightly less thrilling, but oh well. I debated changing needle sizes, but I liked the fabric I was getting, so I stuck with the US1’s and opted to cast on 84 stitches instead of 76. Hopefully, I’ll get caught back up again soon. I also decided that I was going to skip that weird arrangement of stitches and just have needles 1 and 2 on the first circ, and 3 and 4 on the second. 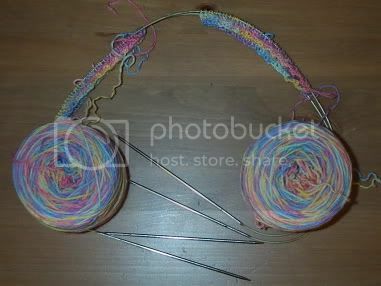 The heel isn’t going to be an issue if it is over needles 1 and 2 instead of 1 and 4. In other news, we had a great weekend. Friday, my 7-months-pregnant cousin, her husband, and their 6-year-old son had come in to town, so we met with them and walked around DC and then had dinner. It was great – we don’t usually see them except at the holidays, so it was really awesome to just hang out for a while. Plus – really good dinner. We went to the Capitol Grille, and I had the most amazing steak – a filet mignon crusted with Kona coffee and topped with shallot butter. Yum. 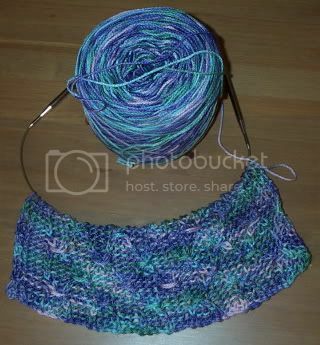 Thursday night, while Kris was introducing Jen to the joys of DDO, I had tried to use my Wool in the Woods Capri to start a Serena wrap, as planned. Unfortunately, the yarn and the pattern were just not working together. So, I was hoping to find something at Woolwinders that might word instead. That would be when I stumbled on the Schaefer Laurel. 100% Pima Cotton, in the most amazing colors. I am always drawn by interesting color names, so I took a look at the tag on one of the hanks. These were part of Schaefer’s Color Concepts “Memorable Women” line. On the left in the picture is “Emily Dickinson”, a gorgeous combination of rose pink, sagey-olive-khaki green, and apricot orange. 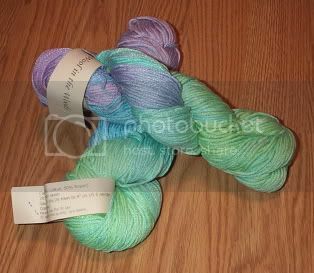 On the right is “Helen Hayes” – purple, blue, and sea green. Each of those are going to become Serena wraps. In fact, the Helen Hayes one was started last night. It’s a little hard to see the stitch pattern in that picture, but it is working up beautifully. Some gratuitous yarn pr0n. Closeups of each of the colors of Laurel. Sunday evening, we went into the DuPont Circle area so that I could deliver the Touch Me scarves to Hillary and Rick. We had dinner and then hung out with Hillary, Carl, Rick, Dave, and James at a bar called Halo. (Hillary wore her scarf the entire evening. Hee!) Halo makes the most amazing mojitos, including flavored ones like raspberry, blueberry, and pineapple (they also make a strawberry, but none of us tried that one). Rick made me a mix cd as a thank-you for the scarf, and it is fantastic. He and I only met a couple of weeks ago, but he either has musical-taste-ESP, or we have VERY similar tastes. Every song on there was either one I knew and liked, or a new one that I now love. And I have decided that I need to find the entire cd of a group called Pink Martini – they are amazing! And my mail man brought me something special yesterday. 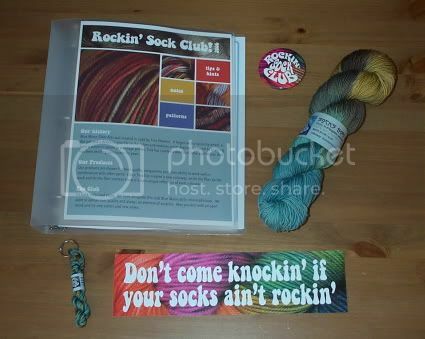 Unfortunately, not the KnitPicks order I’ve been waiting on (grr… I’ll be calling on that if it isn’t here in another day or two), but my first Socks That Rock Rockin’ Sock Club package! That is the notebook for the patterns (with the Cedar Creek Socks pattern inside), a button, a hank of “Rainforest Jasper”, which is quite lovely, a mini hank of “emergency sock yarn” in the same color, and a bumper sticker. A very cute package, and I can’t wait to see this stuff worked up. It’s a gorgeous combination of colors. Plus, now that I have my grubby little hands on it, I can see why it is so loved. It has a wonderful “sproingyness” to it, sort of like Koigu, but it is still quite soft. And I am trying very very hard not to go order some of the “Ruby Slippers” color (see above re: “Wizard of Oz”). There is also an “Emerald City” color, but I haven’t been able to find it. That is probably a good thing, because I reeeeeally don’t need to order any more sock yarn anytime soon. 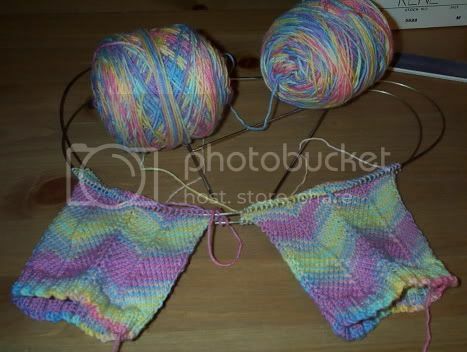 March 21st, 2006 | Tags: BMFA Rockin' Sock Club, Knitting, Planned Projects, WIPs, Yarn Acquisitions | Category: Misc. i’m also using #1s, but mine are slightly too big. the jaywalker pattern is funny like that. do they ever fit anyone right on the first try? i also have some schaefer laurel in my stash. i have no clue what to do with it. thanks for the serena idea! I have had a terrible time with sizing Jaywalkers! First, I knit tight, secondly, I am using Koigu which calls for size 3US. So, I tried a size 2 and I my gauge was probably a stitch or 2 bigger than 4 inches. They are HUGE. Everyone I showed them to said “hmmmm, those look big” but I can’t knit any tighter…so last night for the gazillionth time (remember, I started these with Lorna’s Laces first and had the streaking fiasco) I recast on with 68 stitches and am doing 6 stitches between the increases and decreases. So the short version of what I am trying to say is…I feel your pain sister. Didn’t turtlegirl’s jaywalkers come out too small too? Does this pattern just not have much elasiticy? Seems lots of folks are having sizing issues. She has the BEST colors. Anne is my favorite yarn int he whole world. I hoard it like a gerbil. Great yarn pr0n! I had to rip my Jaywalkers, too! I’m going to re-knit them on size 2 dpns. I had the same issue you had. Grr and argh. At least it will give me a chance to work on Forecast. I’m glad you joined KR – I saw your post and came over to check out your blog. I love that Schaefer yarn and STR – haven’t bought the schaefer yet, because how do you decide? I have some STR and its still sitting there, so I can admire it. I’m thinking of joining the club too……great blog! Beautiful yarn, I love that the three Judy Garlands are skeined the same. I’m knitting my jaywalkers with needle 1 and 2 on the first circ. It’s a lot easier that way anyway. The kFBs start and end the circs, which is perfect. I’m making good progress on the second. Wish I’da done what you did though. I made mine too small too, but am gifting them instead of frogging. Mine will be better anyway! So there! Bah on the swatching!